Originally designed in 1941 by G Morris - Suitable for 1/2A TEXACO RC ASSIST MODEL Wing Area: 288 sq in, Weight: 16 oz. The Parts Sets includes ribs, firewall, tip shapes for wing, fin and stabiliser, dihedral braces, pylon and subfin. 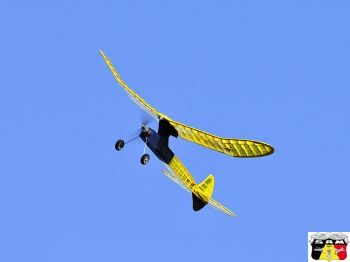 - Includes plan with RC assist modifications or fly it free flight with a Cox TD. Add strip and sheet/wire to complete. Photo courtesy of SAM Belgium who used the Kerswap as their one design Texaco model.